The Batmobile: Justice League Edition | Nerd Much? My father used to nickname all his vehicles “the Batmobile” and as such, they’ve always been a key feature in all the Batman movies we watched together. 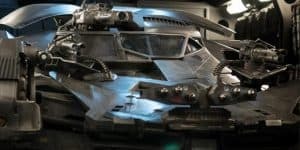 Justice League is no exception, as director Zack Snyder revealed his inner nerd by posting a photo of the famous Batmobile, Justice League edition. By the looks of it, the coolness factor hasn’t waned one bit. The Batmobile is covered in a brushed, rough looking chrome and armed to the teeth. The weapons included in the photo are fairly powerful looking, with your standard pair of turrets on the hood, a box of missiles on the grill, and something extra deadly mounted on the roof. It reminds me a lot of the Dark Knight Batmobile, though hopefully with less wheels involved. This follows the sweet VFX test clip Snyder tweeted earlier last week, which included the very muscled Jason Momoa as Aquaman swimming towards what looks like a character that could be Orm. He hasn’t been listed in the castings yet, however, so I could be entirely wrong. Thus far we’ve got stars Ben Affleck as Batman, Ezra Miller as Flash, Ray Fisher as Cyborg, Henry Cavill as Superman, Amber Heard as Mera, JK Simmons as Commissioner Gordon, and Ciaran Hinds as the villainous Steppenwolf. To be released on November 17 of this year, Justice League looks like a fairly large scale and epic production. Though we shall see for sure when it is released. Hopefully it’s as good as it looks and does not disappoint anyone. What do you think of Snyder’s Batmobile? Does it remind you of another version too? Let us know in the comments below!